File:Mexico City Cycling.webm A bicycle, or bike, is a small, human powered land vehicle with a seat, two wheels, two pedals, and a metal chain connected to cogs on the pedals and rear wheel. A frame gives the bike strength, and the other parts are attached to the frame. The name comes from these two wheels - the prefix "bi-" meaning two, and the suffix "-cycle" meaning wheel. It is powered by a person riding on top, who pushes the pedals around with his or her feet. Riding bicycles, which is also called cycling, is an important way to travel in several parts of the world. It is also a common recreation, a good form of low-impact exercise, and a popular sport. It is also the second most popular spectator sport in the world. Bicycling uses less energy per mile than any other human transport. In 1817 a German professor, baron Karl von Drais, created the first two wheeled bicycle. It was made of wood and had two wheels. The front wheel could be turned using the handlebars in order to steer the bike. However, it did not have pedals, so the rider would have to push their feet on the ground to make it move. In the 1860s, French inventors added pedals to the front wheel. However, it took a lot of effort to turn the pedals. Later inventors made bikes out of metal only, and made the front wheel very big, giving higher speed. This design was called the penny-farthing bicycle. However, it was difficult to ride, since it could fall easily and the rider would fall far. Several improvements were made in the 1880s and '90s. In 1885, the safety bicycle was invented. This had two wheels the same size so that the rider could sit at a lower height. It was called the safety bicycle because it much easier to ride than the penny-farthing. When stopping, the rider can simply put down a foot instead of completely dismounting. Instead of pedaling and steering with the front wheel, the safety bicycle steers with the front wheel while the pedals turn the back wheel using a chain. Brakes operated by hand levers on some bikes also increased safety. In 1888, Scottish inventor John Boyd Dunlop re-invented a type of tire which was filled with air, and this made cycling far more comfortable. Soon, the freewheel was invented. This was a device inside the hub of the back wheel that allowed the wheel to spin even if the rider wasn't pedalling. However, this meant the rider could no longer stop the bike by backpedalling. As a result, a different type of brake was invented which could stop the bike if the pedals were turned backwards. Later inventions included better brakes, and gears which made cycling over hills much easier. During this time the bicycle became very popular. Basic components common to most bikes include a seat, pedals, gearing, handlebar, wheels, brakes, and cables, all mounted on a frame. The majority also have a gear shifter. The cyclist uses his/her legs to turn the pedals around in circles, which moves the chain, which turns the back wheel of the bike to make the bike move forwards. The front wheel is connected to the handlebar, so turning the handlebar from side to side swivels the front wheel which steers the bike. The mountain bicycle is used for riding on rough roads. They have many speeds (usually more than 20), wide tires, and strong wheels. The tire is specially designed to ride smoothly on hills, grass, and mountains. The urban bicycle is made for cities. It`s comfortable and has a relatively high speed. It has a comfortable seat but is heavy. It usually has fenders to keep water and mud from spraying the rider. The difference between a woman's bicycle and other bicycles is the location of the top tube. When women began to ride bikes, they wore long skirts. The manufacturers of bicycles changed the location of the top tube to make it easier for women to sit down on them while wearing a skirt. Some utility bicycles are similar, for riders who make frequent stops. The tandem bicycle is made for two people. It has two pairs of pedals. The cyclists sit one behind another. The first cyclist steers the bicycle. There are bicycles for three and more people. There was a bicycle for 40 people. Folding bicycles can easily be stored in a small place or carried a long distance on an airplane or other public transport. 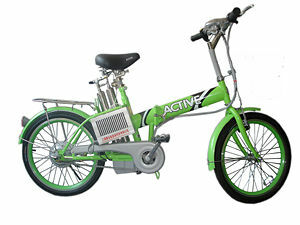 Electric Bicycles have electric motors, usually inside the hub of either the front or rear wheel. You can choose to ride using the motor only, or with pedals only or with both together. In the U.S. the federal government has set a limit of 750 Watts and a top electric-powered speed of 20MPH to have only the rules that apply to bicycles and no extra such as operator license, vehicle license, registration or insurance requirements. A road bicycle usually has narrow wheels, less than 1" (25 mm) wide, with a frame that is much lighter than a mountain bicycle. Road bikes are efficient for longer distances. Many have clips to attach your shoes, rather than just pedals. There are variations, as some road bicycles have regular tires. A road bike can go very fast and is a good choice for a bike race. When riding on streets, it is safest to ride on the same side of the street that cars drive (which would mean riding on the right side of the road in countries where people drive on the right side of the road, and riding on the left in countries where people drive on the left).. To avoid hitting people, riders must obey signs that say "no bicycling", even if it does not seem to make sense at the time. Low light makes bicycle lighting important; so without bicycle lighting, it may be safer not to ride. Wearing a helmet makes bicycle riding safer. More than 300,000 people children alone to go to a hospital every year because they were hurt riding a bicycle. Wearing a helmet does not mean that somebody cannot be hurt if they crash their bicycle, but it makes being hurt less likely. Some bicycles have bells or horns that the rider can use to warn other people that they are riding by them. ↑ "Science of Cycling: Human Power". www.exploratorium.edu. pp. 1. http://www.exploratorium.edu/cycling/humanpower1.html. Retrieved 2007-08-11. ↑ "Bike Safety". kidshealth.org. http://kidshealth.org/kid/watch/out/bike_safety.html. Retrieved July 29, 2010. ↑ "Helmets: How they Work and What Standards Do". bhsi.org. http://www.bhsi.org/general.htm. Retrieved July 29, 2010. This page was last changed on 13 December 2014, at 22:25.